AllThingsDigitalMarketing Blog: "G Whiz!" Two years ago today - Alphabet, abc.xyz was born and Google became "G"
"G Whiz!" Two years ago today - Alphabet, abc.xyz was born and Google became "G"
Today (August 11, 2017) marks the 2 year anniversary when Google became the letter "G"and part of the newly converged organization named Alphabet (abc.xyz). Happy 2nd birthday G! So far I haven't noticed anything different since Alphabet launched 2 years ago and began using the .xyz root server which itinially launched on February 19, 2014. Have you? According to many SEO/SEM industry leaders and ceo.xyz, the .xyz extension has gained momentum and is here to stay. As of November 2015, .xyz reached 1.5 million name registrations with speculation the growth and momentm was most likely due to Google's announcement of abc.xyz. Yet according to TheDomains.com, as recently as June 26, 2016, .xyz had over 5.5 million registrations (nearly 600K registrations per month for the 7 months (November 2015 - June 2016) and became the 4th most registered gTLD (generic top level domain) on the worldwide web after .com, .net and .org. The Blog post below was posted on August 11, 2015 when Google became part of abc.xyz and gave birth to baby G.
In the new Alphabet world at abc.xyz, G is for Google. Of course, Google remains its own, fine-tuned, Google brand as the internet arm for Search, Advertising, Google Maps, YouTube, Chrome, Android, Google Apps, etc. 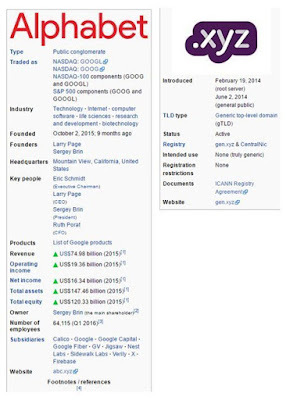 ; However, Google will be owned by the newly created company Alphabet where G = Google. Will C = Calico, F = Fiber, N = Nest, X = Google X, etc. ? 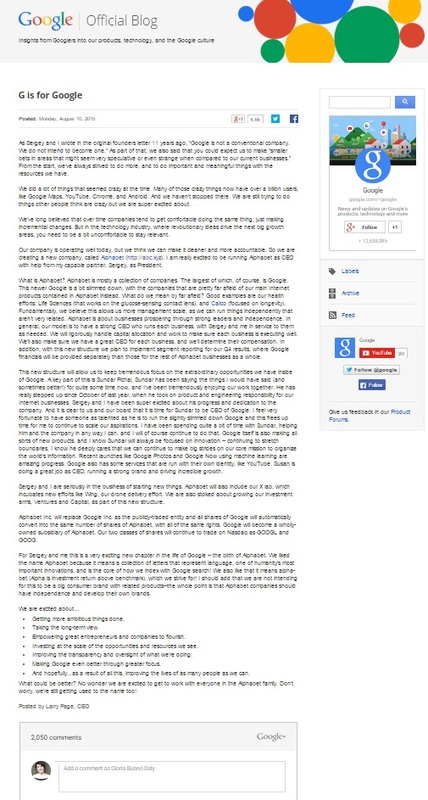 REORGANIZATION OF GOOGLE – What does this mean? All of the other venture projects, i.e., Google X (moonshot which includes driverless cars and delivery drones) Calico (biotech research), Nest (smart home projects), Fiber (high-speed internet), Ventures and Capital (investing), once part of Google, will operate under Alphabet as separate entities. Google co-founders Sergey Brin and Larry Page have new titles, Alphabet CEO and Alphabet President, respectively. Many leading economists equate this recent Google strategy to Warren Buffet’s Berkshire Hathaway business model. Although quite different, (i.e., Google innovative non-consumer product vs. Berkshire Hathaway ordinary consumer products) Berkshire’s Insurance business is the key income generator for Berkshire Hathaway just as Google Search is the key income generator for Alphabet. For the economy it means more jobs including more CEOs for many of Alphabet’s emerging entities, more financing and investment opportunities, and continued technological innovations. RESTRUCTURING OF GOOGLE STOCK – If you own Google’s stock, what will you do? Apparently this new stock structure has to do with transparency for Google’s investments and the new Alphabet will make future acquisitions much more seamless than before. Do you think this restructuring will shed an entirely new light to disruptive innovation and turn the markets upside down?